The Battle of Fort Niagara was a siege late in the French and Indian War, the North American theatre of the Seven Years' War. The British siege of Fort Niagara in July 1759 was part of a campaign to remove French control of the Great Lakes and Ohio Valley regions, making possible a western invasion of the French province of Canada in conjunction with General James Wolfe's invasion to the east. Céloron's expedition consisted of 213 soldiers of the Troupes de la marine (French Marines), who were transported by 23 canoes. The expedition left Lachine on June 15, 1749. The expedition went up the St. Lawrence, continued along the northern shore of Lake Ontario, crossed the portage at Niagara, and then followed the southern shoreline of Lake Erie. 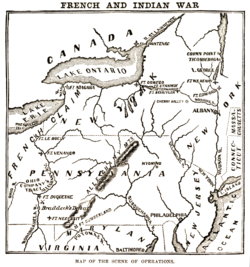 At the Chautauqua Portage (near present-day Barcelona, New York), the expedition moved inland to the Allegheny River, which it followed to the site of present-day Pittsburgh, where Céloron buried lead plates engraved with the French claim to the Ohio Country. Whenever he encountered British merchants or fur-traders, Céloron informed them of the French claims on the territory and told them to leave.